King Coal is taking a lot of blows recently. But at least it could usually count on being the cheapest alternative. Now even that’s called into question. The latest battering to coal’s standing came when Dubai announced June 27 that it would build a massive 800-megawatt solar plant that will produce electricity at an average cost of 2.99 cents a kilowatt hour, substantially below what even coal-fired power plants charge. This rock-bottom price offered by the developers doesn’t benefit from any obvious subsidies and is the lowest price offered by any solar plant in the world.Bloomberg reports that the price is a full 50% below the price a Saudi firm bid just 18 months ago in the same solar park in Dubai – a price that at the time was a record low, but has since been eclipsed by ever-lower prices. That price of less than 3 cents a kilowatt hour is one-third cheaper than a coal plant also being built in Dubai, one that, like the just-announced solar facility, is also expected to start operations in 2020. Young China Watchers (YCW): Many provincial and local governments in China are facing pressure to maintain economic growth while tackling pollution. Are China’s broader economic goals compatible with its ambitions to transition into a low-carbon economy? Mark Clifford (MC): Absolutely. I think the economics have become very clear that China can grow more rapidly if it shifts away from fossil fuels towards clean tech sources of energy such as hydropower, wind, and solar. These are cost-effective—not as cheap as coal, but that’s because the true costs of coal are not usually included. Outdoor air pollution, of which coal is a primary component, kills 1.6 million people every year in China. When we look at the health impacts and broader costs, it is clear that not only can China afford to go towards a greener energy path, it can no longer afford this heavy reliance on fossil fuels. That’s the macro-picture. Although provincial and local-level officials have been told that environmental factors will become more important in their job and performance assessments, they tend to very focused on the short-term: immediate jobs, immediate economic growth, and putting up dirty industry whether it’s factories or a coal-fired power plant. It’s going to be interesting to see how this tension between Beijing and local governments plays out, especially concerning the more than 200 coal-fired power plants approved by local and provincial authorities that are yet to be built. It’s yet unknown whether Beijing can keep this building frenzy under control because it’s clear that China already has a looming excess supply of electricity generating capacity. YCW: The Chinese government has invested heavily in developing one of the largest clean tech sectors in the world. Yet, you say that China’s “’top-down” approach has its limits. What needs to change? MC: Every country’s energy policy is deeply embedded within its political and social structure. China has been lauded by many environmental campaigners for its ambitions to have one of the world’s largest cap-and-trade programs. And yet, the amount of bureaucratic discretion and lack of transparency suggests that it may have been more effective to go the tax route and let people make their own decisions. Prices tend to drive people and companies’ behavior more effectively than regulations; for example, a carbon tax is more effective than a cap-and-trade system. Many resource prices in China are distorted: Electricity prices are far below global norms, which means it is used wastefully and—given coal-fired power plants still produce two-thirds of the country’s electricity—drives excess use of coal. If China could start disentangling itself from the policies and regulatory complexities and rely principally on prices, I think that’s the single most important thing that it could do. This interview was originally published on the Young China Watchers’ blog. The rest of the interview can be accessed here. China has the largest and one of the most dynamic clean tech sectors in the world. The close to $90bn invested in clean tech last year puts it well ahead of both the EU and the US. For all the recent troubles of companies such as Hanergy, China has some of the world’s largest solar, wind and other green tech companies. As growth slows in western markets, they are increasingly looking for business at home. There is good reason for this too. China burns almost half the coal in the world, and accounts for 30% of the world’s greenhouse gas emissions each year. Emissions from coal plants in China are responsible for a quarter of a million premature deaths a year. China’s leaders know that they have a problem. They know that time is running out on the “get dirty, get rich, get clean” strategy pursued by the west. The bill for its environmental degradation is too high for its own people. Originally published in The Guardian. Can be accessed here. Global warming is one of the greatest challenges of our time. 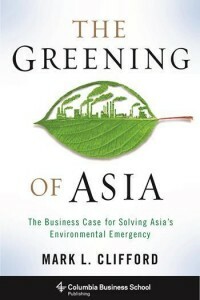 Yet despite all the attention that climate change, air pollution and other environmental issues receive, too few books go inside government decision-making processes to look at the messy, inconsistent and usually unsatisfying business of making and carrying out environmental policies. This specialist book fills some of that gap with a detailed look at policy formulation and implementation related to climate change in three important southern Chinese cities—Hong Kong, Shenzhen and Guangzhou. The focus on cities, and the close-up look at the collaboration between these three cities, is valuable. Around the world, cities are where some of the most innovative and important experiments in environmental policies are being undertaken. Today’s mega-cities are the size of Britain and Germany two centuries ago. There is a wealth of fascinating detail in this book. These are cities with similar populations (seven to nine million), yet many differences. Hong Kong, a Special Administrative Region that enjoys much more autonomy than the other two cities, is much more energy-efficient: it produces more than triple the GDP per unit of energy as Guangzhou and two-and-a-half times that of Shenzhen. Put another way, although Hong Kong is much richer than Guangzhou, it uses less energy.